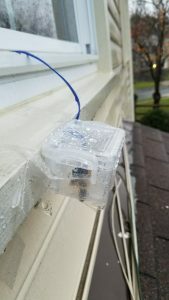 Recently the local Institute of Electrical and Electronic Engineers (IEEE) held two “hands-on” sessions to build an Internet of Things (IoT) weather station. We built it on a breadboard so that the attendees would not have to solder wires. Several of the participants have kept their stations on-line and two have placed the unit outdoors. Finding a suitable outdoor enclosure for the sensors is difficult. There are several available for relatively large sensors with costs from $30 to hundreds. Fortunately, a scrounging mission to Walmart turned up a nice little box for 88¢! The box is 88 x 60 x 50mm (3.25 x 2.38 x 2.00-in). The box is transparent and has a lid the fits over the sides of the box. There is some play between the lid and the box so it allows some air movement. This can be “enhanced” by drilling four 6mm (1/4-inch) holes in the bottom of the box. The box neatly holds a BME280 barometric pressure/temperature/humidity sensor and a BH1750 light intensity sensor. A piece of stripboard mounts the sensor breakout boards. Since the sensors are I2C devices they need four wires (two I2C and 2 power) to connect to the “control unit”. I cut the ends off a flat USB cable from the dollar store. It requires a lot of careful patience to solder the very small wires to the stripboard. I am looking for a better method. My box is mounted to a second-floor window frame with clear packing tape. The window is above a small shingled roof. This is not an ideal location because solar heating of the roof probably affects the temperature reading. In practice, the temperature accurately tracks the local WeatherBug station reading. The unit has been outside since 10 November 2016. It has been through several rain storms with no problems.